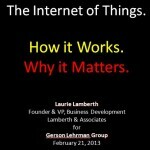 On Thursday, February 21 at 2 pm EST/11 am PST I presented a webcast on The Internet of Things for the Gerson Lehrman Group. 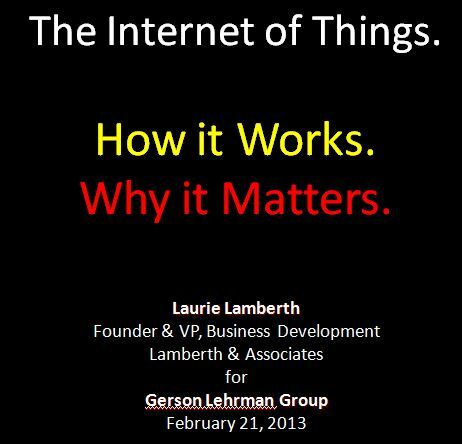 The webcast was an informative and fun 45 minutes during which I lay out what the “Internet of Things” is, how it works, and why it matters to people, communities, and our global society. Gers on Lehrman Group is a research company that employs a network of experts available for advice and consulting on a large variety of topics. I’m a member of their Technology, Media & Telecom Council. My slide deck from the webinar is available here.